Imagine helping clients transform themselves in a single appointment – boosting their confidence in just a 60-minute session. When you have the right education, you can help your clients improve their confidence, feel better about themselves, and even take years off their appearance. Our beauty academy serves Parkersburg, WV and offers an exciting career opportunity for those looking to jumpstart their future. Whether you want to become an esthetician, hair stylist, or a massage therapist, our academy gives you the education you need to do what you have always been passionate about. 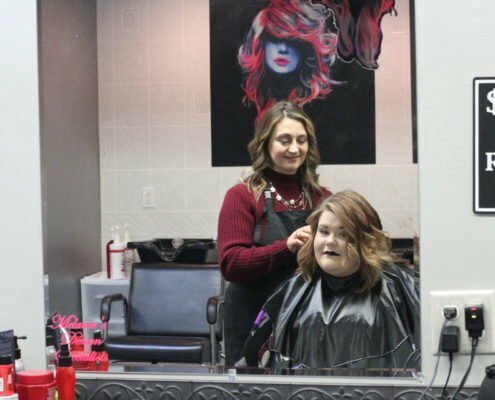 Preston’s Beauty Academy is just a 30-minute drive from Parkersburg, and we have plenty to offer locals and students interested in our school. That’s why so many of our students make the short drive to Marietta to attend our beauty school. Our academy offers not only a premier beauty education but clinical services. You can work in our salons to fine-tune your skills and prepare yourself for branching out on your own one day. At Melanie’s Design Specialists, we let our licensed graduates offer everything from massages to nail services to hairstyling and facials in our Marietta beauty shop. This high-fashion salon offers the latest trends and traditional techniques so that we can accommodate just about any customer request. Laser Removal Services: Remove unsightly hair, get rid of a tattoo, and rid your body of unsightly veins. We also offer laser acne removal so that you can remove blemishes and reduce scarring. Skin Rejuvenation: Feel years younger by removing areas of dark pigmentation, resurfacing your skin for a youthful glow, and eliminating pesky skin tags. We are Accessible: Whether you live in Ohio or West Virginia, you will find that our Marietta and Vienna locations are quick and easy to get to. That means you can make a short drive, take your classes, and then resume life all without a long commute. Clients Love Us: When you get your education at Preston’s Beauty Academy, you establish long-term relationships with clients who come to our centers for their treatments. To be successful, you need a dedicated customer base – and Preston’s Beauty Academy can help you build it. If you are ready to take your career to the next level, apply at Preston’s Beauty Academy, LLC. We want to help you succeed, and we have had hundreds of students just like you come to our school and go on to have successful, rewarding careers. Contact us directly to get your application started at 740-374-5434 or inquire online about our academy opportunities.